later on. In order to reduce the slip to ^ per cent, of a •condensation of about 60000 would be required *. 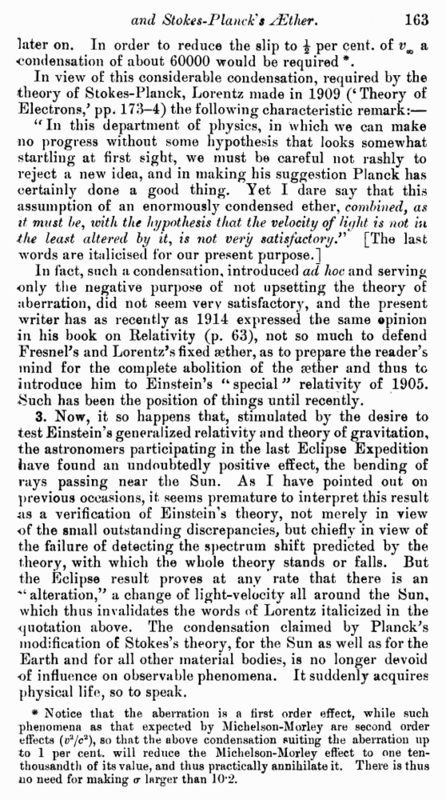 In fact, such a condensation, introduced ad hoc and serving only the negative purpose of not upsetting the theory of aberration, did not seem very satisfactory, and the present writer has as recently as 1914 expressed the same opinion in his book on Relativity (p. 63), not so much to defend Fresnel's and Lorentz’s fixed aether, as to prepare the reader’s mind for the complete abolition of the a?tber and thus to introduce him to Einstein’s “special” relativity of 1905. Such has been the position of things until recently. 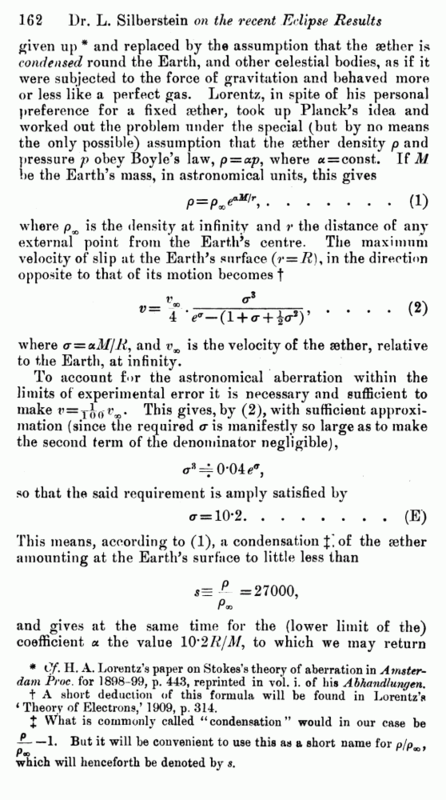 alteration,99 a change of light-velocitv all around the Sun, which thus invalidates the words of Lorentz italicized in the quotation above. The condensation claimed by Planck's modification of Stokes’s theory, for the Sun as well as for the Earth and for all other material bodies, is no longer devoid of influence on observable phenomena. It suddenly acquires physical life, so to speak. * Notice that the aberration is a first order effect, while such phenomena as that expected by Michelson-Morley are second order effects (v2/c2), so that the above condensation suiting the aberration up to 1 per cent, will reduce the Michelson-Morley effect to one ten-thousandth of its value, and thus practically annihilate it. There is thus no need for making <r larger than 10*2.